Pioneering technology using solar energy for wireless communication is set to benefit millions of people across the world. The technology, which uses solar energy to create the power for Li-Fi technology, was developed by a research team at the University, led by Professor Harold Haas, in partnership with University spin-out company, pureLiFi. The technology will have impact particularly for populations in rural communities that do not have existing infrastructures for electric power, the internet and Wi-Fi access. 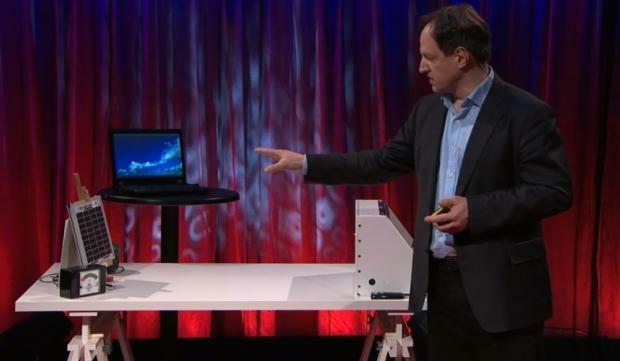 At this year’s TED Global 2015 event in London, Professor Haas demonstrated how Li-Fi can be used with solar cells to receive data. He described how the likes of solar panels on houses or other objects such as smart watches can absorb power and receive data at the same time. With the help of this technology, smart watches could be powered and connected to the internet through light. During his talk, Professor Haas stressed that over four billion people worldwide do not have access to the internet and with little energy infrastructure in developing countries to support traditional broadband and Wi-Fi, solar energy can bring transformational change to this situation. "The potential expansion to the internet is massive and my aspiration is that this broadband solar panel receiver technology for Li-Fi will help solve the challenges of the digital divide throughout the world." The prototype used in the demonstration was built in a collaborative partnership between the University’s Li-Fi Research & Development Centre and pureLiFi Ltd, a University spin-out company. pureLiFi is widely acknowledged as the global pioneers of using the visible light spectrum instead of radio frequencies to enable wireless data communication.